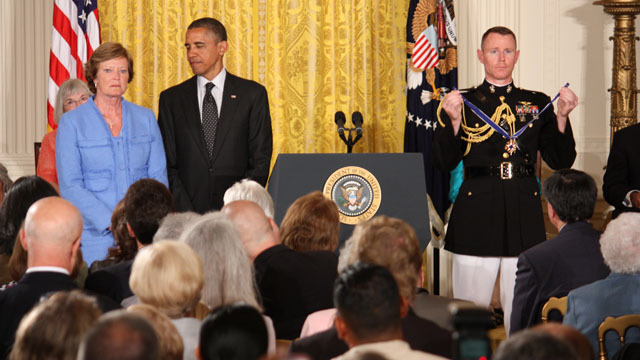 WHITE HOUSE (CNN) - President Obama honored a dozen heroes from all different aspects of life to the White House and presented them with the highest civilian honor, the Medal of Freedom. The group of honorees included signer and songwriter Bob Dylan, former astronaut and senator John Glenn, former Supreme Court Justice John Paul Stevens, former Secretary of State Madeleine Albright, and legendary women’s basketball coach Pat Summitt. Three recipients were honored posthumously, including the founder of the Girl Scouts Juliette Gordon Low. Obama commented that all 13 individuals were personal heroes in his life. He mentioned reading novelist Toni Morrison’s Song of Solomon as a teenager and listening to Dylan’s music when he was in college. He praised John Doar for his work as a Justice Department official who enforced civil rights in the 1960s. “I think it's fair to say that I might not be here had it not been for his work,” the president said. He also mentioned how the winners had impacted his family, particularly his daughters’ lives. For more of the story, check out what our friends at CNN wires wrote here. and he awards this medal to Albrite...who is currently a paid lobbyist of China...and a complete failure as secretary of state...a true embarrassment to hard working Americans who can think for themselves. Well that says to me that he does speak sometimes on his own, without having to read a teleprompter pressed up against his jaw, up his nose or a piece of paper. You all claim he can't put a sentence together or utter a word without them!! Did you read the whole thread about it, and the explanation as to what happened and why?? It was logical and a reasonable enough explanation to me and most sensisible folk, I though!! But that's just me!! You are a 'dimwit', @demwit!! And says "Polish death camps" which is a sign of ignorance and shame. How could CNN's ace reporter Becky Brittain miss that one!? Another sign of ignorance and incompitence or perhaps a designer question "not of interest: to CNNs readers?? FORWARD to total depravity !!! Pat Summitt sure looks elated by the honor!! And – what is Obama looking at? This is very unusual for CNN – usually their shots of Obama look very presidential. Pat Summitt is a class lady. Looks like Obama's sneaking a peek at some white meat in the photo. JERRY'S MOM. NO WONDER HE'S P-I-S-S-ED. If he is looking at white meat, he's probably trying to imagine if it would look even better, dark!! He loves dark meat!! He's proved that already!! That's his choice!! Run for President Jerry!! Put your political savvy to work where it counts!! I know you can do it!! You are proving it right here on this blog site!!! You old veteran politician you!! You have all the answers to EVERYTHING!! If they can pull Mitt out of the hat, I know they'd just love you!! Give it a go!! The Rethugs will just love you!! Obama could have asked Dylan, "How does it feel?"